Tampa, Florida heavy metal four-piece War of Thrones, fronted by vocalist Wade Black (ex-Crimson Glory, ex-Leather Wolf), have been around since 2012. The group has recently lauched an album titled ‘Conflict in Creation,’ and Wade, guitarist Rick Renstrom and bassist Rich Marks joined forces to answer our questions about their mission, album’s creative phase, and more. Define the mission of War of Thrones. Rick: Our mission is to capture the hearts and stimulate the minds of our listeners. We want to be a voice for them and make great music overall. We want to create something original and not just something that is thrown together. Tell me about the creative process that informed your album “Conflict in Creation” and the themes it captures. Rich: The state of the world is what inspired the record. We are at war! Not with just ideology like, religion or even our political views, but right down to our core as the internal battle wages. Creatively, we all drew from one another. Wade would come up with a killer vocal line and we would write around it or Rick would come up with a killer riff and we would build from that. I would throw down some bass and we would build from that. Then, we test the songs live and see how they worked. Then, simply adjust from there. We didn’t want to rush this record. We just let creativity and vision take its course and I feel there’s something for everyone. Shredding guitars and basses, epic guitar solos, bass solos and epic vocals! It’s all there! We craft it, right into our songs. What is the message you are trying to give with “Conflict in Creation”? Wade: Really, it’s awareness that the struggles, we as people, face. they are the same struggles for everyone. You’ve got Poverty, Corruption, Murder, Drug Addiction and the people that prey upon others, with those struggles. It’s also a message of redemption and the choices we make. We also encourage people to stand strong and fight for their beliefs and to believe in your selves! Don’t bow down to the wrong doings in this world! Stand strong and believe in yourselves. Rich: That’s a great question! We wrote everything down and captured the musical idea’s in our studio. Lots and lots of chicken fingers, cheese sticks and beer from the corner store kept us going! Seriously though, a few composition books and recording demos in our studio is how we documented our songs. The chemistry between us is very strong and writing came very easy for us. Rick: Absolutely! Each song is crafted from the ground up and fine-tuned until we were all satisfied with the end result! We really wanted to deliver a powerful record one that would stand out in the crowd and I believe we exactly achieved that. Rich: We really tried to bring the live element to the record and transfer the power generated as such. Rick had a big part in that as he produced the record. He’s worked with Roy Z and several other producers and really has a knack for it, so that helped tremendously! We look at it as art. Start with a clean canvas. Record the drums, then layer guitars, bass, atmosphere in the way of keyboards and finish it off with vocals. Rick is a harmonizing machine, so he worked with Wade on building the harmonies. We worked vigorously to capture the perfect guitar and bass tones really wanting to give it that live power and energy, so when your turn the record up to ten, that’s when you’ll get it! How long “Conflict in Creation” was in the making? Rich: Well that’s a tricky question. Wade: Rick and I had been in other bands in the past and really developed a great chemistry. The hard part was finding the right musicians who could not only handle the gig but could bring their own element to the band so it took Rick and I a few years before I found Rich and as soon as I saw him play, I introduced him to Rick and that’s when it all really started to come together. Rick, Rich and I have been together for 7 years and we actually wrote the record in 6 months but it has taken us a long time to put the right drummer in the drummer’s seat. We started working with Patrick and after that it took us approximately a year to record the record. Rich: We actually tried not to listen to a whole lot of people at that time simply because we were looking to create our own vision not a knock off of anyone else. Wade: It can be great if used properly! Rich: I mean to much of today’s music is emailed and really written one sided and with that, you’re not really getting the band feel and that makes a huge difference in how the music sounds and how each song evolves because you just lose that. Three or four guys sitting there, hashing out and building a song. It really becomes one sided and I feel a lot of today’s music has become that way. Sometimes it’s great and other times it’s not, but on the pro side it’s easier to store idea’s and share them now. It’s also become easier for bands to do their own thing and that’s why there’s more music out there than ever before! Rick: I would always recommend going to a pro studio if possible if you want the best sound. Unless you have the necessary skills to do otherwise! Wade: We hope so! I think most musicians do! It would be great to know that you helped someone feel better when they’re down or inspired a person to be there best or even brought to people together. There’s always those that want to influence people’s lives for the better. Wade: To record another record! We already have it written! We would love to tour and play as many shows as we can. There’s nothing like the personal experience that a live show gives between an artist and there fans! We are playing Rocklahoma at the end of May and our label is currently booking shows and festivals all over! So, be sure to keep your ears and eyes open for our shows. 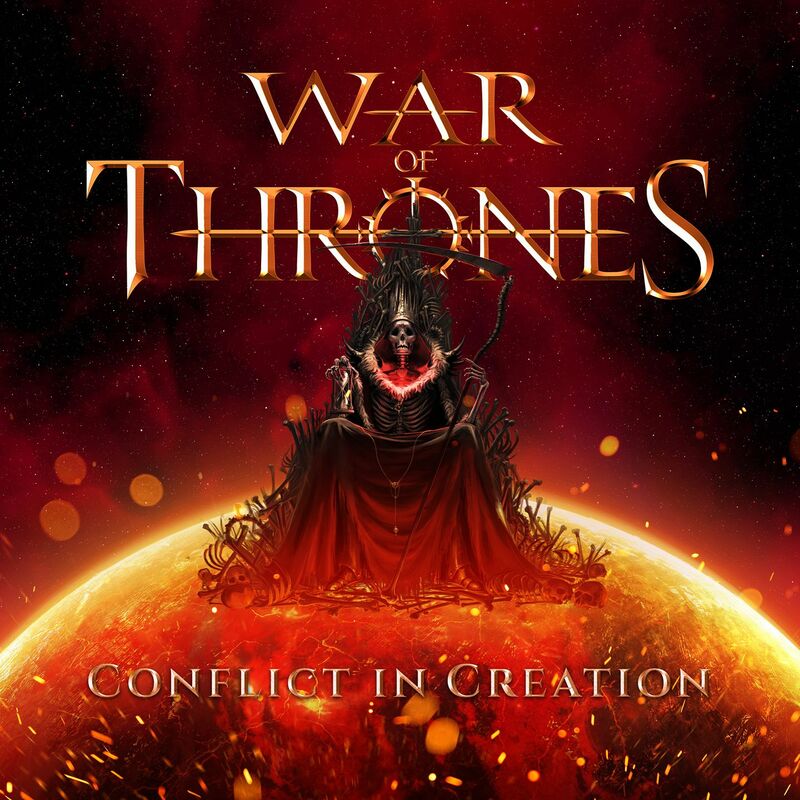 Conflict in Creation is out now; get it from iTunes. For more information about War of Thrones visit their website.